For these artists of the ‘native study’ school, theirs was merely an attempt to record for posterity the literal appearance of a vanishing traditional African lifestyle. Stern’s Cape Girl with Fruit (1930) (98 x 93 cm) fetched a record R1,760,000 at the Stephan Welz & Co. auction held on 8 May 2000 in Johannesburg. 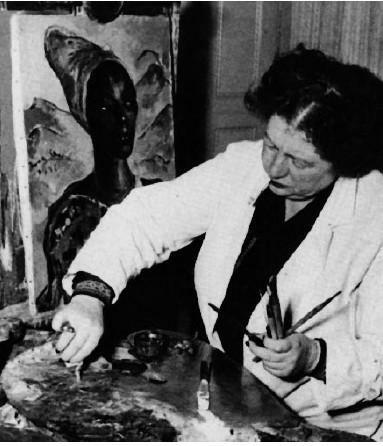 Marion Arnold’s Irma Stern: A Feast for the Eye (1995), and Women and Art in South Africa (1996) are two such studies that are indispensable reading. Irma Stern, ‘My Exotic Models’, The Cape Argus, 3 April 1926. Marion Arnold. Irma Stern: A Feast for the Eye, p. 102. Interview with Irma Stern, The Cape Argus, 7 July 1933. Marion Arnold. 1995. Irma Stern: a Feast for the Eye, p. 73. Richard Feldman. South African Opinion, May 1935. Born Schweizer-Reneke, Transvaal, 1894; died Cape Town, 1966. Training 1913: Weimar Academy under Gari Melcheris (1860–1932). 1914: Studio Levin-Funcke under Martin Brandenberg (b.1870). 1914: Briefly at the Bauhaus, Weimar Germany. Selected Exhibitions 1918 onwards: Stern participated in group exhibitions in Germany, South Africa and many other countries. 1919: First solo exhibition at Galerie Gurlitt, Berlin, the first of over 100 solo exhibitions held in Europe and South Africa. 1948: South African Art, Tate Gallery, London. 1962: Solo exhibition, Grosvenor Gallery, London. 1967: Memorial exhibition, Grosvenor Gallery, London. 1968: Homage to Irma Stern, memorial exhibition at the Iziko SA National Gallery, Cape Town, Pretoria Art Museum and Johannesburg Art Gallery. 2003: Irma Stern: Expressions of a Journey, Standard Bank Gallery, Johannesburg. 2003–2004: Irma Stern Portraits, SA Jewish Museum, Cape Town. Collections Irma Stern Museum, University of Cape Town; Iziko SA National Gallery, Cape Town; Kunsthalle In Bielefeld, Germany; Nelson Mandela Metropolitan Art Museum, Port Elizabeth; Tatham Art Gallery, Pietermaritzburg; Durban Art Gallery; Ann Bryant Gallery, East London; William Humphreys Art Gallery, Kimberley; Museum Afrika, Johannesburg; University of South Africa Collection, Pretoria; Hester Rupert Art Museum, Graaff-Reinet; Collection of the late Queen Elizabeth the Queen Mother; Oliewenhuis Art Museum, Bloemfontein; Sanlam Art Gallery, Bellville, Cape.